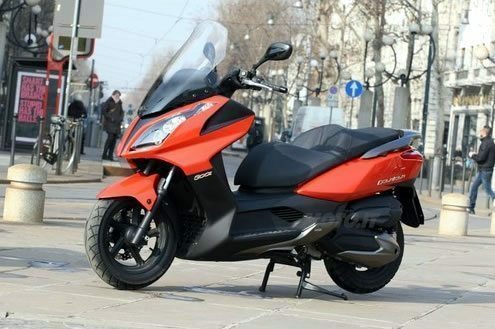 The all new 2011 KYMCO Downtown 300i’s have landed in Canada, many have been awaiting its arrival date. The Downtown 300i was designed with maxi-scooter performance and sport bike agility for the perfect scooter experience. The scooter looks particularly sharp and looks equally as good on paper. We took our first look at two of them today at Studio Cycle Group in Toronto. The powerplant is a 300cc liquid cooled, four stroke engine with electronic fuel ignition and automatic CVT transmission. The result is a smooth, fuel-efficient engine that will be as comfortable taking you around the town as it will around the province. All without shifting gears. We’ve already seen videos on YouTube of the Downtown 300i doing 160 and accelerating quickly from 0 to 120 km/hr. We were happy to see front and rear disk brakes (see our disk brakes vs. drum brakes comparison), although we weren’t too surprised as KYMCO seems known to bring the best bang for your buck in the realm of quality scooters. The Downtown also offers adjustable dual rear shocks and telescopic forks to handle suspension just like bigger motorcycles and scooters. We can’t find anything wrong with being able to fit both a full face motorcycle helmet and a half face motorcycle helmet in a lit underseat storage area. Moreover, the KYMCO Downtown 300i has dashboard storage with a built-in 12V charger so it’s ready to handle your GPS or just charge your cell phone as you ride. Believe it or not the Downtown 300i weighs less than KYMCO’s retired Bet & Win 250 scooter. We’re looking at under 370 lbs and the bike’s length and weight distribution seem to give it a light feeling in the showroom. Center stand & side stand – Both come standard, offering both a practical options for riders, not the case for other brands such as Vespa. 12.5 lt fuel capacity – Doesn’t sound like much, but we’re guessing fuel efficiency at 60-70 mpg, bringing us to over 300 km on $15 of gas. Tire sizes 120/80-14 Front; 150/70-13 Rear – not sure where we stand on these, we’ll have to take a KYMCO Downtown 300i out for a test ride / demo ride to find out for sure. 2 Year Warranty – Another KYMCO exclusive in the Canadian scooter marketplace. The powerplant is a 300cc liquid cooled, four stroke engine with electronic fuel ignition and automatic CVT transmission. The result is a smooth, fuel-efficient engine that will be as comfortable taking you around the town as it will around the province by highway. All without shifting gears. We’ve already seen videos on YouTube of the Downtown 300i doing 160 km/hr and accelerating quickly from 0 to 120 km/hr. See our comparison of liquid cooled vs. air cooled engines. We were happy to see front and rear disk brakes, although we weren’t too surprised as KYMCO seems known to bring the best bang for your buck in the realm of quality scooters. 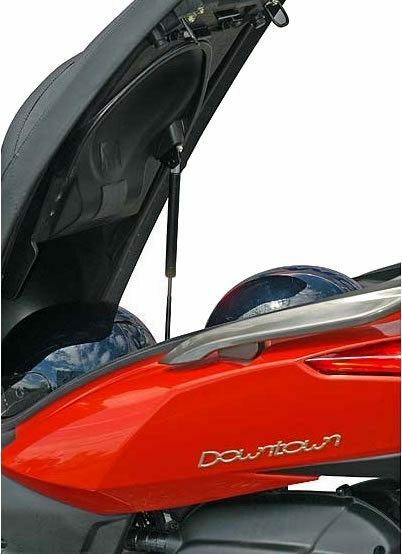 The Downtown also offers adjustable dual rear shocks and telescopic forks to handle suspension just like bigger motorcycles and scooters. See our comparison of disk brakes vs. drum brakes. 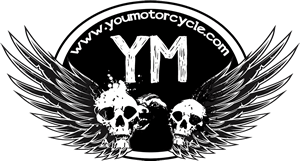 You may be interested in reading our KYMCO Venox 250cc, KYMCO Quannon 150cc or other reviews! Next: Get Off Your Phone And Drive!